As the “Holy and Great Council” of the Orthodox Church gets underway in Crete amid defections by several churches, most notably the Russians, there’s a whole other Orthodox family that was never going to be part of the action in the first place. There is a Holy and Great Council of Orthodoxy scheduled to meet at the Orthodox Academy in the Greek island of Crete from 16 to 27 June 2016. Are you invited to that Council? George: In fact, this is a Council or Synod of all the Churches belonging to the so-called Eastern Orthodox traditions such as the Greek Church, Russian Church, Romanian Church and so on. This is called the Eastern Orthodox family of Orthodox Churches. We also have the Oriental Orthodox family, which includes the Coptic Church, Syrian Church, Armenian Church, Ethiopian Church and Indian Malankara Church. We belong to a different family of Orthodox Eastern Churches and, as we agree with the other families in almost all things, we have come to a fresh agreement that we hold the same apostolic faith. But, because of the Christological disputes that arose in the 5th century at the Council of Chalcedon, there is no Eucharistic communion between these two families. There are very serious attempts to restore Eucharistic communion as far as possible. Now, the Synod, which is called the Holy and Great Holy Council, in fact divides the Oriental Orthodox as one separate family. We will be invited [as observers], and I suppose the Roman Catholic Church is also invited. But I understand that the invitees are free to attend the first ceremonial opening and the final ceremonial conclusion. The invitees will not participate in the discussions or deliberations of the Synod. I am personally very close to some of the people who are in the Council. I am not going for the Synod, but I am closely watching its outcome. Together, they represent some 84 million faithful and are among the oldest Christian bodies in the world. As a result of the rupture, the council in Crete was never going to be truly “pan-Orthodox,” in the sense of embracing all the Orthodox churches of the world. Although representatives of the Oriental churches have been invited as observers, they’re not voting members. In this interview, the Rev. Dr. K.M. 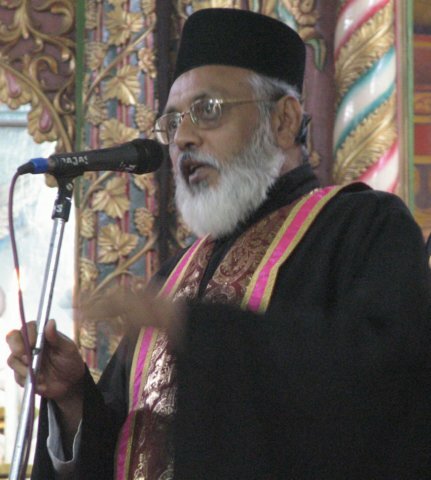 George, a priest of the Malankara Orthodox Syrian Church in India and principal of the Orthodox Theological Seminary in Kerala, India, reflects on the council and its prospects. George also insisted that the “Holy and Great Council” can’t be compared to the Second Vatican Council of the Catholic Church, because each Orthodox church is independent and there are forces within those churches that may resist whatever the council adopts. “The problem in the Eastern Orthodox Church is that the conservative groups, particularly those in the monasteries of Mount Athos – around 20 monasteries for the last 1,000 years – hold on to a very fundamental understanding of Christianity,” he said. “Everyone who is outside the Orthodox Church is heretical, according to them,” George said. The interview was first published by Light of Truth, a publication of the Archdiocese of Ernakulam, Kerala, and appears here with permission. This entry was posted in Featured News, News and tagged Eastern Orthodox Church, Great Council, Oriental Orthodox Churches, Orthodox Eastern Churches, Roman Catholic Church by Orthodoxy Cognate PAGE. Bookmark the permalink.